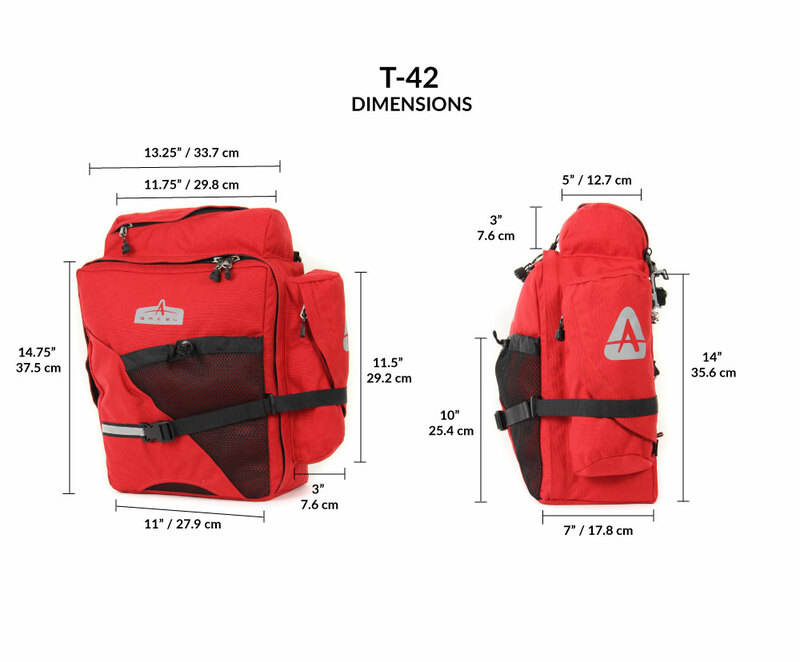 The T-42 Classic touring panniers are made of super tough 1000 Denier US made Cordura and comes equipped with our patented Cam-Lock® mounting system to keep the panniers on the rack no matter the conditions you ride in. 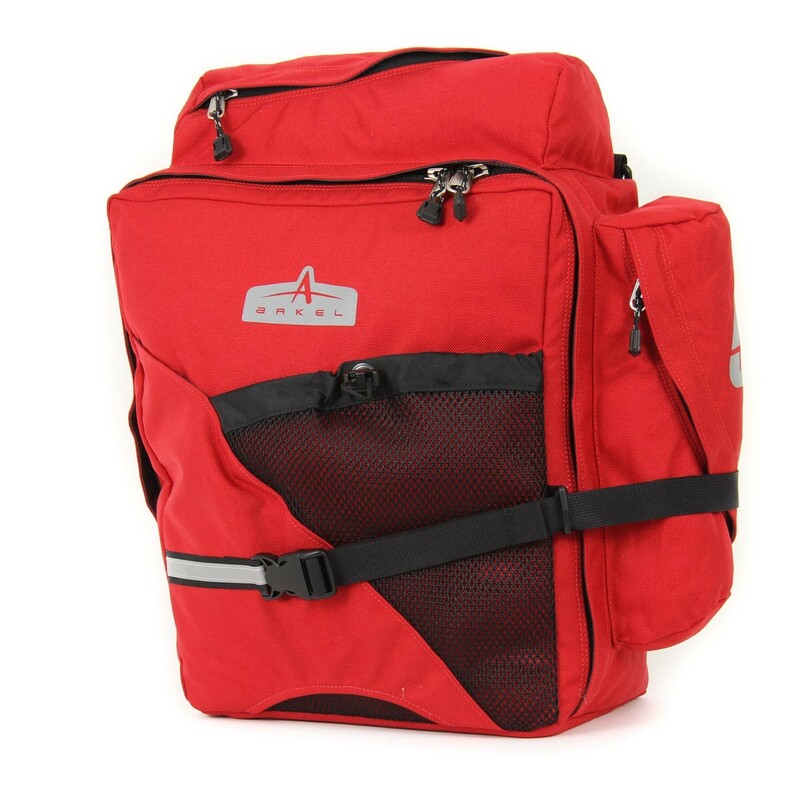 The top and side zippered pockets are great for quick access to small items and the front mesh pocket is a great place to store a wet jacket or any other piece of clothing you need to shed during your ride. 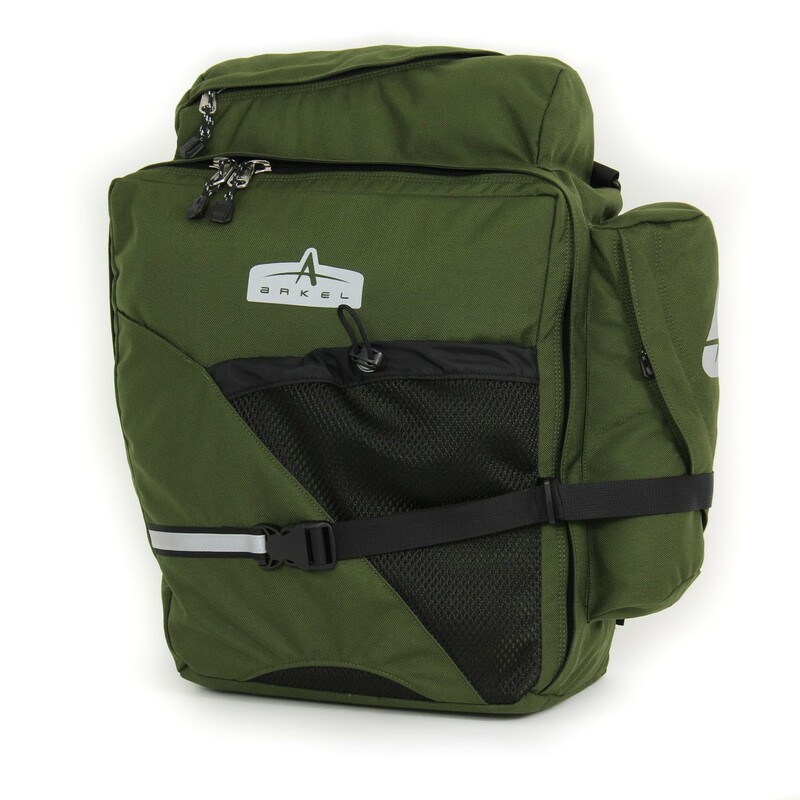 The large size YKK zipper on the main compartment goes all the way down the front of the pannier and opens up completely, just like a suitcase, for ease of access and functionality. 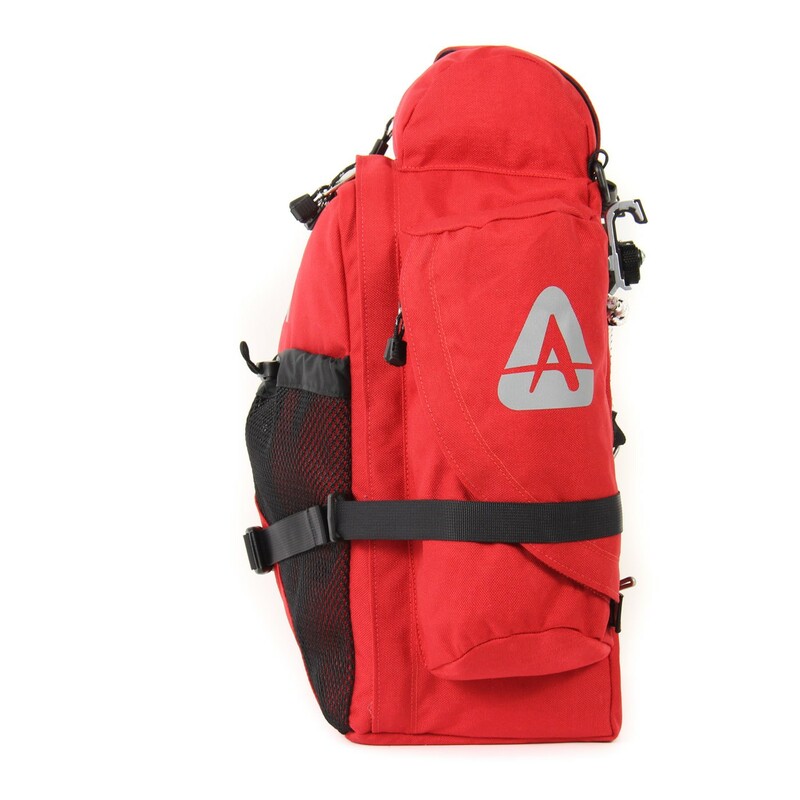 Finally, a lightweight aluminum frame and rigid bottom inside the main compartment will prevent the bag from sagging. 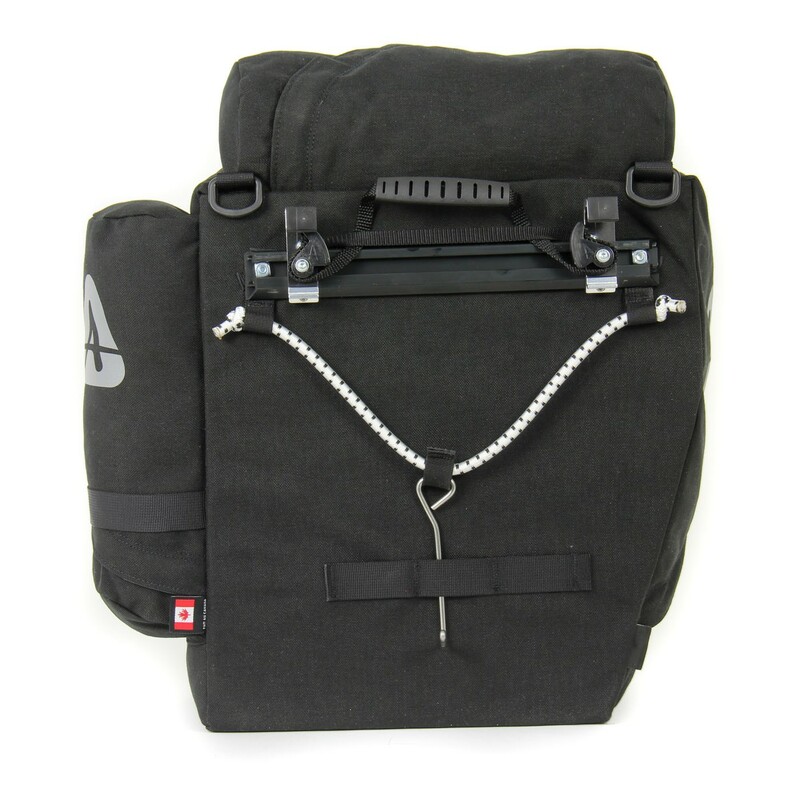 Made of tough 1000 Denier Cordura. 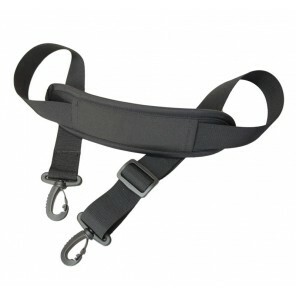 Large #10 YKK zipper on main compartment. 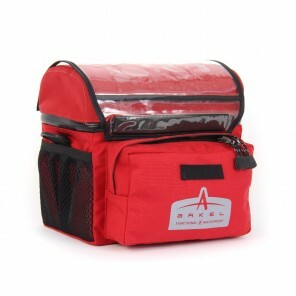 Front mesh pocket great for storing wet jacket on the go. Two zippered pockets for easy access to small items. Front of pannier opens completely for great access. 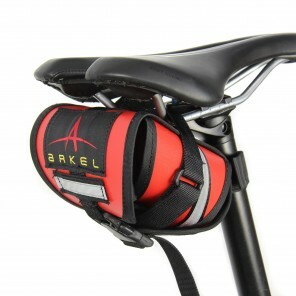 Cam-Lock® Hook system keeps the panniers on the rack in all riding conditions. Internal aluminum frame and rigid bottom prevents sagging. Bought 2017 T42s planning two major rides. I plan credit card mode, with no tent or cooking gear. 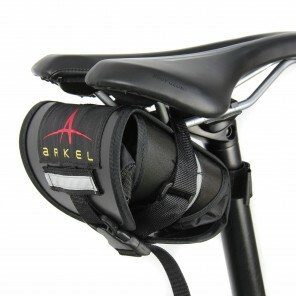 I am using these with a small Arkel bar bag only, no front panniers as of yet. I just finished arise from Half Moon Bay to Santa Barbara California. Bought these based on slight knowledge of panniers in general. Customer support and willingness to believe in Canadian quality closed the deal. I opted for the cam lock system because I witnessed Ortleib users making a two handed effort to release or attach. The cam lock system worked flawlessly over my 8 day trip. No rattles, wiggles, or jamming. This is a high point for the T42s IMO. 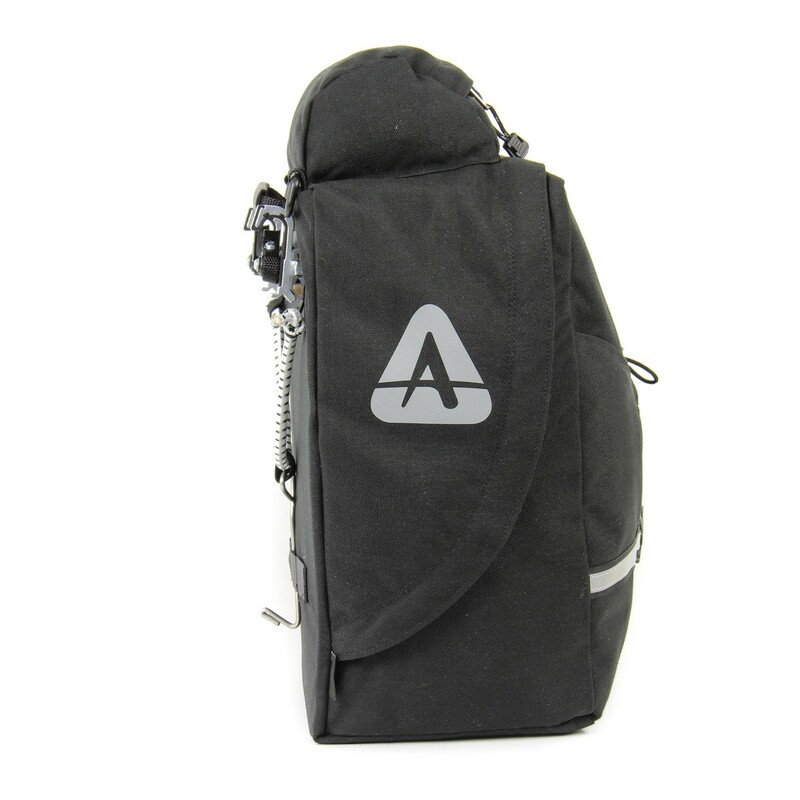 The external pockets were super convienient when quick access was needed. The zippers work well, but I am still learning how to negotiate the run around the corners of the big flap. 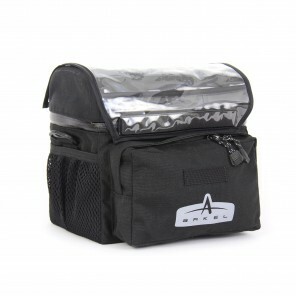 This is the biggest pannier/bar bag combo I would need unless I planned to do camping and cooking. Overall, couldn’t be more pleased. Hats off to Arkel. I took my first trip this week from Santa Cruz, CA. to Half moon bay For a short three day trip they are fine. The material and zippers are incredibly strong. You can over stuff them and still get the zipper to close. I don't think there is a better set of bags out there. I liked them so much I bought the T28's for when I take longer trips. I am very pleased and think they are well worth the small fortune they cost (a poor man speaking). When the T28's get here I will take a 300 mile trip and will leave my review for both sets of bags. Have used my black T42s for 4 years of year round Canadian commute and summer tours,a testament to old world quality and workmanship with new world maerials. Also use xm28s on front racks on longer tours.the ease of axess with the t42 is great for picking up groceries and people ar.e amazed when they see how they consume 4 bags of groceries. Fantastic product. If you know you will ride 20,000 or so. Buy these. For commuting - one bag holds everything I carry: clothes, shoes toiletries and shoes, toel and sometimes laptop and heavy-duty lock. Big enough to lold dress pants and shirt to arrive unwrinkled. I've had these since 2005. Two years ago upgraded to the cam operated release. 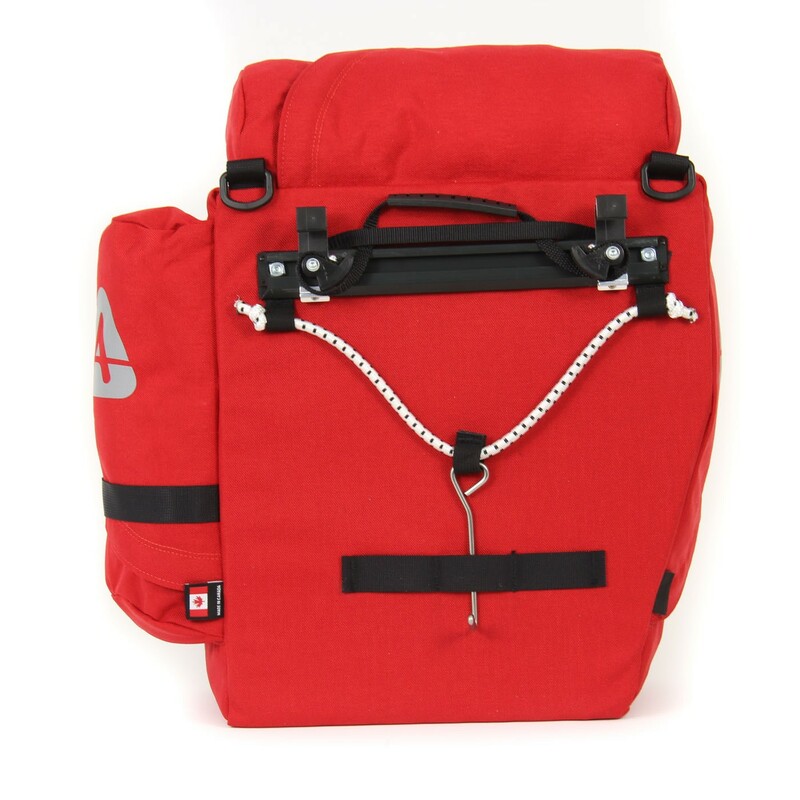 The bags have 16K commutes, plus one week credit card camping trips with no failure in fabric attachments or zips. 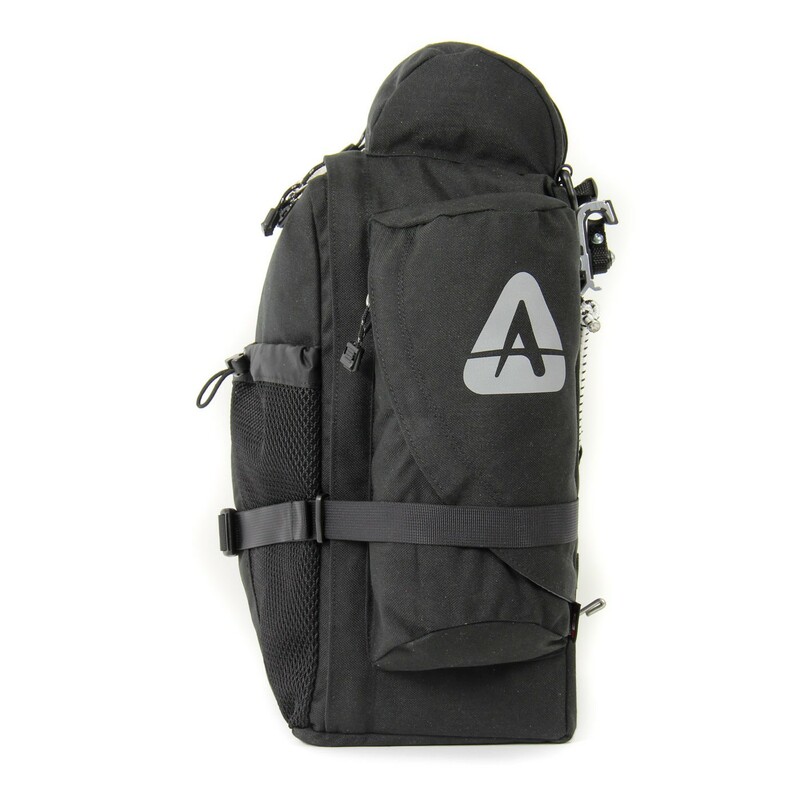 I would like them to wear out so that I could try a T18 backpack which may be a better commuter. 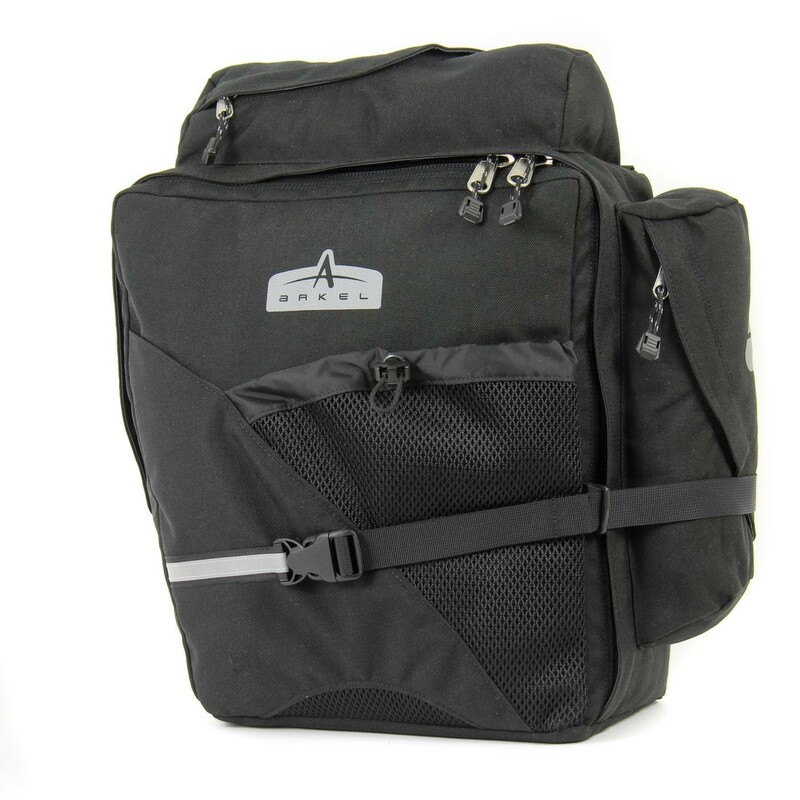 500 miles from Le Puy to Pamplona, 500 miles from Pamplona to Santiago de Compostela, and 750 miles from Geneva to Rome... these bags worked miracles on our three (unsupported) adventures biking medieval pilgrimage routes. 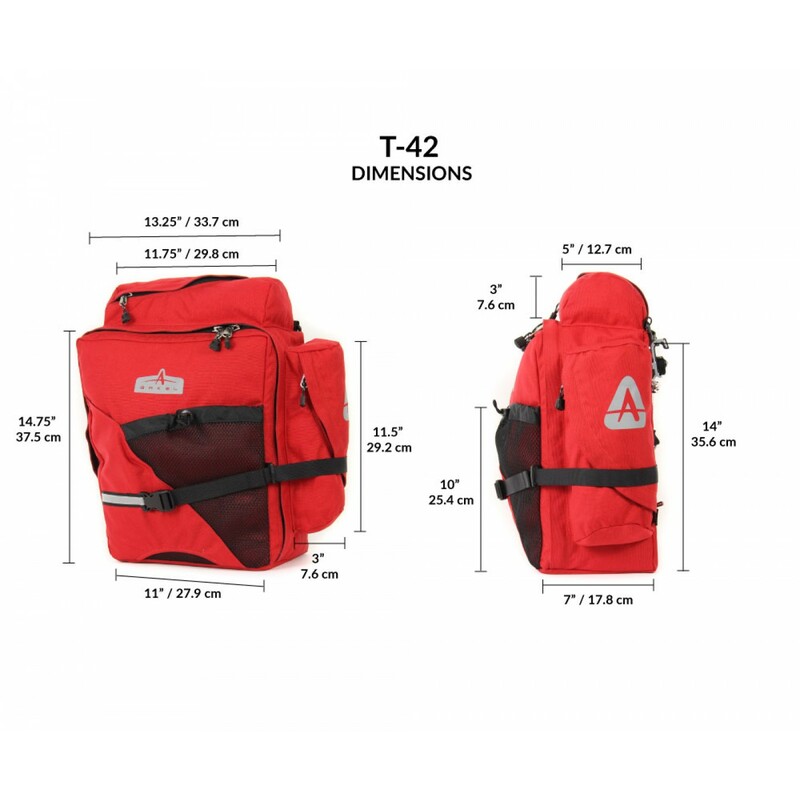 All three of us used the T-42s and we will be using them for future trips! Easy to get things in and out; easy to get the bags on and off (even with a mending broken collar bone); loved the exterior mesh pockets and top pocket. It's all the bag I need.